Brentford's Championship play-off hopes took a hit as Bolton twice came from behind to draw at Griffin Park. Adam Le Fondre turned the ball beyond David Button to equalise, but the home side were back in front before the break after Jonathon Douglas' header. The Bees leapfrogged Wolves, who drew at home to Ipswich in the day's early kick-off, but remained three points behind the Tractor Boys, who have a superior goal difference. Bolton, who have secured Championship football for next season, remain in 17th position. The visitors began on the front-foot and Heskey, one-on-one with goalkeeper Button, should have given them an early lead but his shot went wide of the upright. Brentford then took the lead in the 35th minute with a speedy counter-attack from Alan Judge, who played in Spurs loanee Pritchard at the back post for this 11th of the season. Button produced a superb fingertip save to deny Giles Coke's low shot, but the Trotters equalised four minutes later with Le Fondre's calm finish inside the far post. In a relentless finish to the half, Andre Gray's shot cannoned against the woodwork, before Judge's cross found Douglas in the area and his looping header back across the keeper put the home side ahead. Brentford piled on the pressure early in the second half but failed to create any clear-cut chances. James Tarkowski's short back-pass then left goalkeeper Button scrambling and Davies nicked it off him before slotting into an open goal for Bolton's second equaliser of the match. Brentford boss Mark Warburton: "We looked good going in at half-time and we'd worked hard to force the game on the front foot. After the break, the loose ball has cost us and we were a little bit sloppy in the final pass, perhaps because the players wanted to force the game a little too much. "There will be a lot more twists and turns this season. We are far from disappointed because we can still get 78 points this season and if we do, then who knows what might happen?" Bolton boss Neil Lennon on suspending Neil Danns and Barry Bannan after an alleged bust-up at the team hotel: "I am not a massive disciplinarian but we set standards at the club and discourage players from going out and socialising. "I am disappointed with their behaviour - they fell short of what is required of them and have been suspended, but I'm in a good mood today so we'll see how long it's for." Match ends, Brentford 2, Bolton Wanderers 2. Second Half ends, Brentford 2, Bolton Wanderers 2. 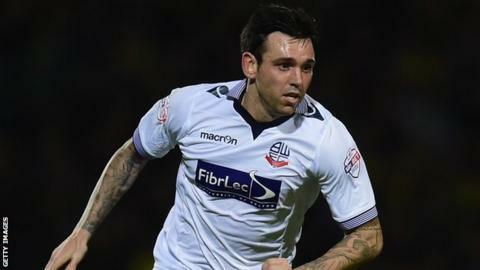 Delay in match Paddy McCarthy (Bolton Wanderers) because of an injury. Attempt blocked. Jon-Miquel Toral (Brentford) left footed shot from outside the box is blocked. Assisted by Jota. Attempt saved. Harlee Dean (Brentford) left footed shot from the right side of the box is saved in the centre of the goal. Assisted by Jon-Miquel Toral. Attempt missed. Jonathan Douglas (Brentford) right footed shot from the right side of the box is too high following a set piece situation. Liam Feeney (Bolton Wanderers) is shown the yellow card. Emile Heskey (Bolton Wanderers) wins a free kick on the right wing. Stuart Dallas (Brentford) is shown the yellow card. Stuart Dallas (Brentford) has gone down, but that's a dive. Attempt saved. Jake Bidwell (Brentford) left footed shot from outside the box is saved in the centre of the goal. Assisted by Stuart Dallas. Attempt missed. Stuart Dallas (Brentford) left footed shot from the right side of the box is close, but misses to the right. Assisted by Tommy Smith. Substitution, Bolton Wanderers. Saidy Janko replaces Oscar Threlkeld because of an injury. Delay in match Oscar Threlkeld (Bolton Wanderers) because of an injury. Substitution, Brentford. Jon-Miquel Toral replaces Alan Judge. Corner, Brentford. Conceded by Paddy McCarthy. Delay in match Stuart Dallas (Brentford) because of an injury. Attempt saved. Stuart Dallas (Brentford) left footed shot from the left side of the six yard box is saved in the bottom left corner. Corner, Bolton Wanderers. Conceded by Harlee Dean. Attempt blocked. Liam Feeney (Bolton Wanderers) right footed shot from outside the box is blocked. Assisted by Eidur Gudjohnsen. Goal! Brentford 2, Bolton Wanderers 2. Mark Davies (Bolton Wanderers) left footed shot from the right side of the six yard box to the centre of the goal. Corner, Bolton Wanderers. Conceded by Moses Odubajo. Offside, Bolton Wanderers. Dorian Dervite tries a through ball, but Emile Heskey is caught offside. Corner, Bolton Wanderers. Conceded by Stuart Dallas. Substitution, Bolton Wanderers. Eidur Gudjohnsen replaces Giles Coke. Tom Walker (Bolton Wanderers) is shown the yellow card for a bad foul.